How to Uninstall Fantastical on Mac OS X? Home »	Uninstall » How to Uninstall Fantastical on Mac OS X? Issue: How to Uninstall Fantastical on Mac OS X? Hi! 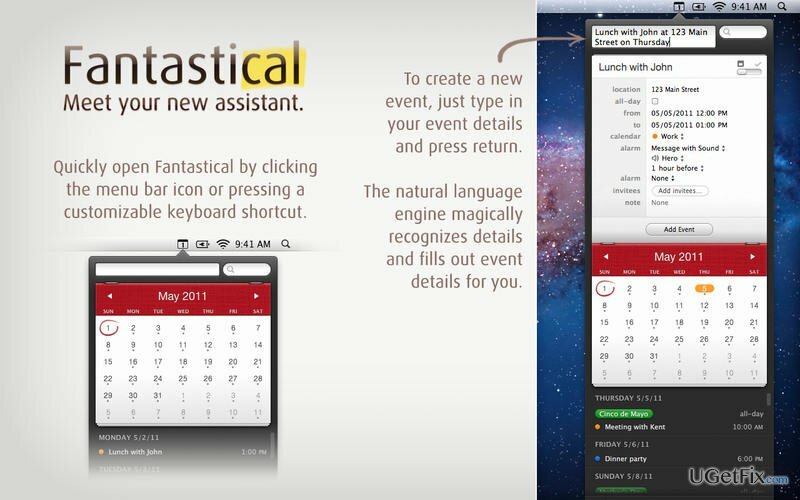 I’ve got an app called Fantastical on my Mac which is not a bad tool but still I don’t need it anymore. However, there is some kind of a problem related to its uninstall. I though that I’ve removed it, but it seems that there are some file leftovers or something. So could someone please explain how to uninstall Fanatic on Max OS X? It’s not surprising that you’ve have installed Fantastical some time before because it’s a Mac calendar that users all around the world enjoy using. It allows creating events quickly and easily, features user-friendly interface, is capable of recognizing the location of your event and allows inviting people from the contacts to the scheduled event. Indeed, sounds great! Unfortunately, people’s opinions differ, so for some people this app may not meet expectations and they may decide to uninstall Fantastical on Mac. Here’s where the problem lies. People often fail to remove it completely and leave the system contaminated with various files that belong to this tool. To prevent this from happening, we’ve decided to prepare a guide explaining how to uninstall Fantastical on Mac OS X, so keep reading. First of all, it’s very important to keep in mind that dragging the icon of a certain application to the Trash does not mean that you’ve uninstalled it. This process is called ‘removal’ which means that you will not see the program on the desktop anymore. However, it doesn’t mean that all files, registries, and processes are eliminated as well. Therefore, in order to uninstall Fantastical on Mac OS X completely, you should either remove all its components manually, which, of course, is a long and tiresome process, or you may employ a program that has been developed for cleaning Macs like, for example, MacKeeper. Hold Ctrl and click on Empty Trash in order to clean this folder. This process is a bit risky since you may accidentally remove the wrong files and damage important system programs. That’s why we believe that MacKeeper is a better solution for cleaning your Mac. This tool is free to use and its installation will take only two simple steps; however, we are pretty sure that you will be pleased by its performance. Kaip išinstaliuoti Fantastical iš Mac OS X?